This store usually has Dora and Diego blankets hanging off the awning. They would always make my son start chanting "Dee-go, Dee-go" as we walked or rode home. He doesn't know Spidey or Betty Boop, so that little ritual is already a thing of the past. Anyway, get your sheet sets or animated blankets soon. This store is the latest in 5th Avenue's closings. I think we'll be seeing a few more GOOB signs soon. Then again, there have also been several fairly recent additions to that area of 5th Avenue. 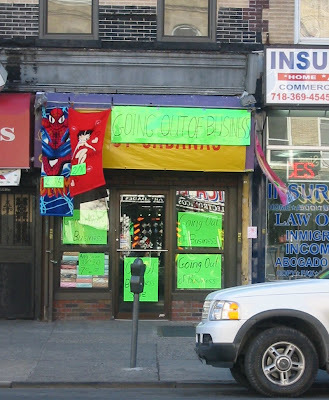 Two cellular/electronics stores, another Mexican restaurant, a Lechonera, and a 99cent type store.